Music was an important part of life in ancient China. It was the the most popular form of entertainment, and for some men and especially women it was their profession. In Nineteen Old Poems (Gushi Shijiu Shou, 古诗十九首), a selection of anonymous poetry from Eastern Han Dynasty (25~220 BCE), one of the most common topics is music and singers. There are descriptions of singing and dancing, of the emotions stirred by music and banquet, of the experience of listening to a performer. Chinese musical aesthetic tradition hails the combination of those who where able to produce sorrow through their performances and the “knowing listeners” (zhiyin, 知音)– those in whom this sorrow arose. It is the shedding of tears that is valued, not just the music one hears. It stands as high as floating cloud. Between the eaves and flights of stairs. Its sound so sad,its tune so drear. But one whose secret grief’s life-long? The middle tune wafts ill at ease. I sigh that connoisseurs are few. With her while flying wing to wing. After arriving home in Yangzhou, father paid off debts by selling or pawning things. He also borrowed money to meet the funeral expenses. Between grandma’s funeral and father’s unemployment, our family was then in reduced circumstances. After the funeral was over, father was to go to Nanjing to look for a job and I was to return to Beijing to study, so we started out together. We entered the railway station after crossing the River. While I was at the booking office buying a ticket, father saw to my luggage. There was quite a bit of luggage and he had to bargain with the porter over the fee. I was then such a smart aleck that I frowned upon the way father was haggling and on the verge of chipping in a few words when the bargain was finally clinched. Getting on the train with me, he picked me a seat close to the carriage door. I spread on the seat the brownish fur lined overcoat he had got tailor made for me. He told me to be watchful on the way and be careful not to catch cold at night. He also asked the train attendants to take good care of me. I sniggered at father for being so impractical, for it was utterly useless to entrust me to those attendants, who cared for nothing but money. Besides, it was certainly no problem for a person of my age to look after himself. Oh, when I come to think of it, I can see how smarty I was in those days! I said, “Dad, you might leave now.” But he looked out of the window and said, “I’m going to buy you some tangerines. You just stay here. Don’ t move around.” I caught sight of several vendors waiting for customers outside the railings beyond a platform. But to reach that platform would require crossing the railway track and doing some climbing up and down. That would be a strenuous job for father, who was fat. I wanted to do all that myself, but he stopped me, so I could do nothing but let him go. I watched him hobble towards the railway track in his black skullcap, black cloth mandarin jacket and dark blue cotton-padded cloth long gown. He had little trouble climbing down the railway track, but it was a lot more difficult for him to climb up that platform after crossing the railway track. His hands held onto the upper part of the platform, his legs huddled up and his corpulent body tipped slightly towards the left, obviously making an enormous exertion. While I was watching him from behind, tears gushed from my eyes. I quickly wiped them away lest he or others should catch me crying. The next moment when I looked out of the window again, father was already on the way back, holding bright red tangerines in both hands. In crossing the railway track, he first put the tangerines on the ground, climbed down slowly and then picked them up again. When he came near the train, I hurried out to help him by the hand. After boarding the train with me, he laid all the tangerines on my overcoat, and patting the dirt off his clothes, he looked somewhat relieved and said after a while, “I must be going now. Don’t forget to write me from Beijing” I gazed after his back retreating out of the carriage. After a few steps, he looked back at me and said, “Go back to your seat. Don’t leave your things alone.” I, however, did not go back to my seat until his figure was lost among crowds of people hurrying to and fro and no longer visible. My eyes were again wet with tears. In recent years, both father and I have been living an unsettled life, and the circumstances of our family going from bad to worse. Father left home to seek a livelihood when young and did achieve quite a few things all on his own. To think that he should now be so downcast in old age! The discouraging state of affairs filled him with an uncontrollable feeling of deep sorrow, and his pent-up emotion had to find a vent. That is why even mere domestic trivialities would often make him angry, and meanwhile he became less and less nice with me. However, the separation of the last two years has made him more forgiving towards me. He keeps thinking about me and my son. After I arrived in Beijing, he wrote me a letter, in which he says, “I’m all right except for a severe pain in my arm. I even have trouble using chopsticks or writing brushes. Perhaps it won’t be long now before I depart this life. “Through the glistening tears which these words had brought to my eyes I again saw the back of father’s corpulent form in the dark blue cotton-padded cloth long gown and the black cloth mandarin jacket. Oh, how I long to see him again! source: Zhang Peiji, (1999) “Selected Modern Chinese Prose Writings”, Shanghai Foreign Languages Education Press. Beginning in Tang Dynasty (618~907), new music from Central Asia began entering China and soon became all the rage at the cosmopolitan Tang court and in Tang urban culture. From the lyrics set to this so-called banquet music (言乐, yanyue), there arose a new poetic genre, the ci (词), “song lyric”. The ci poems were written into hundreds of tune patterns, each of which strictly determined by the number of characters per line, the placement of rhymes, and the position of tones. Originally the ci were actually sung to these tunes, but eventually the tunes themselves were lost, and all that remained were the hundreds of ci patterns (词牌 cipai) with their many variations. To this day, one speaks of “filling in the words” to a song lyric (填词, tian ci) according to the matrix associated with its tune title. This genre developed into a major alternative to traditional shi (诗) poetry during the Song Dynasty, when it is traditionally thought to have reached its height. In the famous ci poem “The Beautiful Lady Yu”, Southern Song Dynasty (1127~1279) poet Jiang Jie (c.1245~1310) tells his life story. 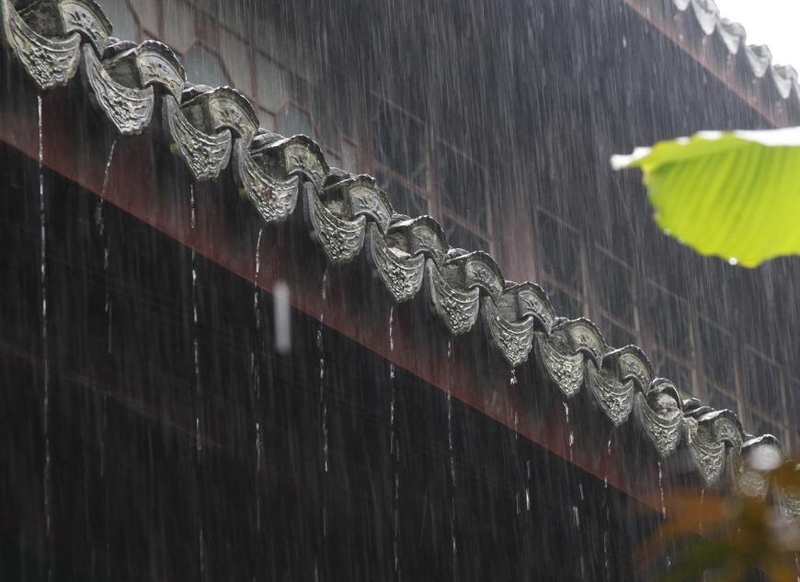 The poem, which is commonly known as “Listening to the Rain” (听雨 Ting Yu), poignantly and powerfully calls attention to the different emotions at stages of the poet’s life, set against the sameness of nature. While nature seems to eternally repeat itself in a predictable way, human life can never really repeat itself in a predictable way. Human life can never really repeat itself without noticeable change, not even in such a seemingly innocuous act as listening to the rain. In fact, it is precisely the sameness of nature and the seeming sameness of the poet’s habit of listening to the rain that trigger his deepest pathos about the vicissitudes of life. While young, I listened to the rain in house of song. Men meet and part with joy and sorrow. Let raindrops drip until the morrow! Xu Yuanchong. (2007). Three hundred Ci of the Song Dynasty. China Translation and Publishing Company. Cecile Chu-chin Sun. (2011). The Poetics of Repetition in English and Chinese Lyric Poetry. University of Chicago Press. Zong-qi Cai. (2013). How to Read Chinese Poetry: A Guided Anthology. Columbia University Press. Chinese literary critics have honored Du Fu (712~770) as the “Poet Historian” since Northern Song Dynasty (960~1127). The most directly historical of Du Fu’s poems are those commenting on military tactics or the successes and failures of the government, or the poems of advice which he wrote to the authorities. Indirectly, he wrote about the effect of the times in which he lived on himself, and on the ordinary Chinese people. “Song of the Conscripts” (兵车行 Bingche Xing, literally “Ballad of the Army Wagons”) was written in around 750, when China under Emperor Xuanzong of Tang Dynasty (685~762) frequently engaged in wars with neighboring countries on its western border. It gives voice to the sufferings of conscript soldiers in the imperial army and criticizes China’s military expansionism. “Song of the Conscripts” sets the scene around Chinese capital Chang’an (today’s Xi’an) with a long column of conscripts heading north to the Wei River Bridge and off to the frontier. A bystander elicits a monologue from one of the conscripts, who complains of the length of service, deserted farmland, and the anticipation of a futile death on the battlefield. A Tang paper fragment with a few lines of this poem has been found in the sands of Central Asia, testifying that the poem actually traveled with where the troops did. The conscripts march with bow and arrows at the waist. To see them off; the bridge is shrouded in dust they’ve raised. Their grief cries loud and strikes the cloud straight, straightaway. An onlooker by roadside asks an enrollee. “The conscription is frequent,” only answers he. And were sent west to till the land at forty. Just home, they’re sent to the frontier though their hair’s gray. The emperor’s greed for land is still at high flood. Where briers and brambles grow in villages far and nigh? Thorns and weeds in the east as in the west o’ergrow. Our men are driven just like dogs or fowls in flight. “You are kind to ask me. To complain I’m not free. The magistrates for taxes press. How can we pay them in distress? We would have preferred girl to boy. A daughter can be wed to a neighbor, alas! Bleached bones since olden days unburied on the plain? The air is loud with screech and scream in gloomy rain. Kang-i Sun Chang, Stephen Owen, The Cambridge History of Chinese Literature, 2010, Cambridge University Press. The story of Tang Ju is recorded in Zhanguo Ce (战国策, “Strategy of the Warring States” ), a fictionalized work of history first circulated during the Latter Han Dynasty of China (25~220 CE ). Unlike military strategy manuals that center on Sun Tzu-style martial tacticians, Zhanguo Ce highlights the group known as moushi (谋士, “strategist-persuader”) and their skills as politicians, rhetors and diplomats during the Warring States period (475~221 BCE). Tang Ju was such a moushi serving Anling, a minor protectorate of the State of Wei. In 225 BCE, King Zhao of Qin (324~251 BCE) conquered Wei, posing an immediate threat to Anling. 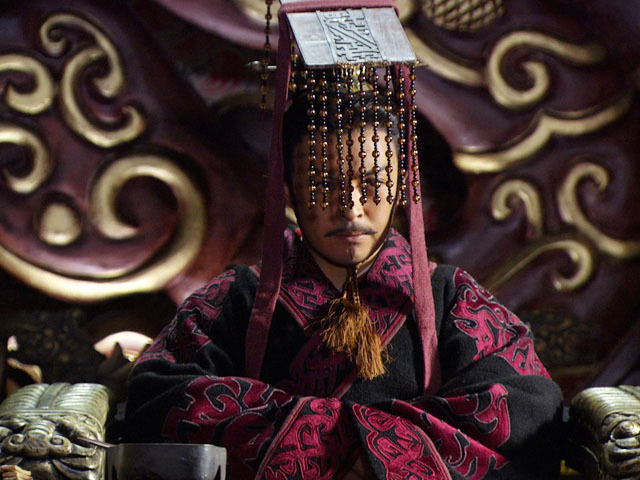 To save his endangered lord, Tang Ju went to meet furious King Zhao and successfully settled the dispute by wisdom and courage. The King of Qin was annoyed and angry. He spoke to Tang Ju and said: “And has your Lordship heard of the wrath of the Son of Heaven?” Tang Ju replied: “Your servant has not heard.” The King of Qin said: “The wrath of the Son of Heaven lays low a million corpses and makes blood to flow for a thousand li.” Tang Ju said: “Has Your Majesty heard of the wrath of a commoner?” The King of Qin said: “The wrath of commoner makes himself take off his hat, walk barefoot, and knock the ground with his head!” Tang Ju said: “This is the wrath of a mediocre person, not the wrath of a gentleman. When Zhuan Zhu assassinated King Liao a comet covered the moon. When Nie Zheng assassinated Han Gui a white rainbow pierced through the sun. When Yao Li assassinated Qing Ji black falcons fought above the palace. All these three gentlemen were commoners. While they were cherishing their wrath and before it had come forth, portents descended from the Heaven. And your servant will make a fourth! If a gentleman must be wrath, the corpses of two men will lie low and their blood flow five paces. This is the day for the world to put on mourning.” He drew his sword and arose. Wrote during the Ming-Qing transition, Chinese poet Wu Weiye (1609~1671) was classified under the category of “officials who served two dynasties” (贰臣, erchen). He held office under the Qing from 1654 to 1656 and later regretted it. Wu’s post-1644 writings are stuffed with lamentation for the fall of the Ming Dynasty, nostalgia for the world before its collapse, and, after his journey north to take office late in 1653, regret and anguish over his own irresolution and compromises. Most people have accepted Wu’s version of events — that he unwillingly took office under pressure from his family and the Qing authorities. Honored as a “poet-historian” (诗史, shishi), Wu Weiye often chose to write longer ancient-style poems and ballads, forms that lend themselves to elaboration of descriptive and narrative detail, unfolding arguments, and shifting perspectives. In his famous “Song of Yuanyuan” (圆圆曲, Yuanyuan Qu), he put individual’s perspective against historical upheavals. 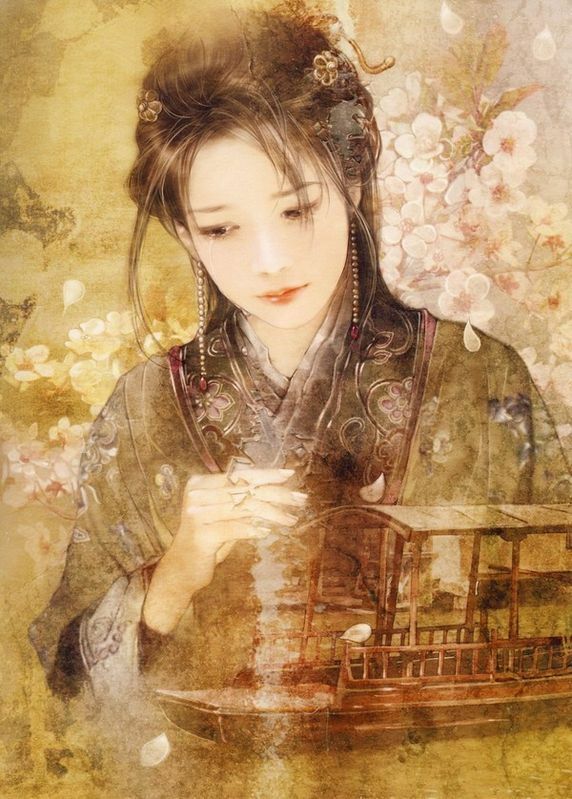 According to various miscellanies and historical sources, the courtesan Chen Yuanyuan (1624~1681) was taken captive when Beijing fell to the rebels in 1644. Outraged at this turn of events, her lover Wu Sangui (1612~1678), military commander of the strategic Shanhai Pass, the eastern terminus of the Great Wall, joined forces with the Manchus and marched upon Beijing to facilitate the Manchu conquest. Wu did not make “Song of Yuanyuan” a warning against moral decadence and sensual indulgence, but remains sympathetic to Yuanyuan, who in the poem comes to stand for the helplessness and confusion of individual caught in cataclysmic turmoil. Who was such a girl? source: Kang-i Sun Chang & Stephen Owen, “The Cambridge History of Chinese Literature Volume 2: From 1375”, Cambridge University Press, 2010. Wen Tianxiang（1236 –1283) was a prominent scholar, military leader, and poet in the late years of the Southern Song Dynasty. Having passed the imperial examination as the top scorer at a young age, he gradually rose up the ranks and served as the Prime Minister. Wen positively organizing the Chinese resistance against Mongol invasion and was captured. He was tortured for years and ultimately executed, never wavering in his loyalties. 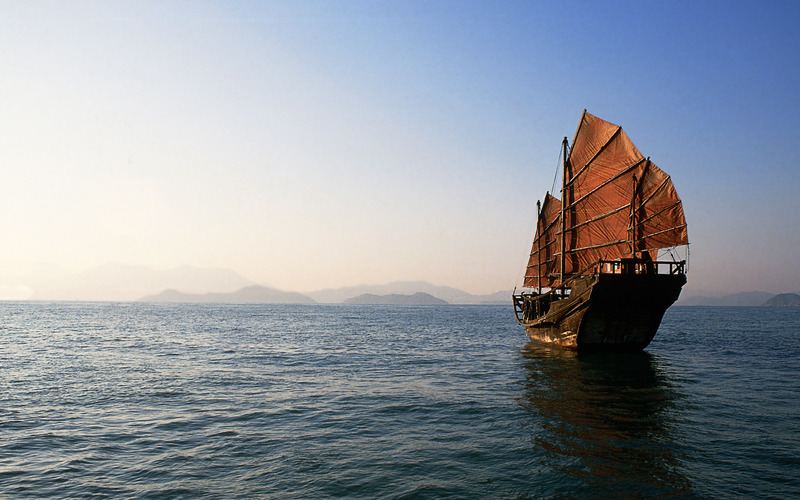 Crossing the Lonely Ocean was written in early 1279 when Wen was being escorted from Guangdong to Beijing to meet Kublai Khan, the new ruler of China. The Lonely Ocean (伶仃洋/零丁洋, Lingding Yang) is also known as Lintin Sea. A part of South China Sea, it locates in the south of the Zhongshan County, Guangdong Province. The Frightful Shallows (惶恐滩, Huangkong Tan) is one of the eighteen dangerous shallows in the Gan River of Jiangxi Province. The Mongols entered Jiangxi in 1275 and defeated Wen’s army there in 1277. Brought all-round destitution and ruin. The aspect of duckweeds beaten by rain. For being captured, and all alone. Has not in death ended his life? Shining red in History’s archive. source: Wang Zhihuan, Selected Lyrics on Themes of Patriotism and Moral Integrity： from Ancient to Modern Chinese Classic Poetry, 1995, China Translation & Publishing Corporation.